Partners of different zodiac signs bring out slightly different facets of the Cancer personality. Some elements however are fairly common to all Cancer relationships. Cancers are very sensitive and caring people. Prone to giving their all, they typically rush headlong into commitment. Less likely than other signs to bail when the going gets tough, Cancers are very loyal and determined to work things out. Cancers are champions of their loved ones and will fiercely protect and defend them. Known for their sensitivity, Cancers can be very sentimental when things are going well, yet if things get difficult their feelings get very hurt quickly. They are careful with themselves and may not easily show their vulnerabilities when first beginning a relationship. Yet when handled with care and respect they blossom, giving devotion and loyalty for life. Sentimental in the extreme, Cancers are likely to notice the little things and keep track of things better than other signs. Cancers are often labeled "pack rats" for the simple reason that their deep rooted memories link them to external things and they feel better when surrounded with specific things kept "just so". This can be remembered handily by their lovers, and showing respect to a Cancer’s belongings will make them love you all the more. Respect and devotion is very important to Cancers. They are typically not outlandish or crude at all. Their love style is one of steady quietness that is very appealing in the long term. They make excellent parents as well, bringing their own brand of sensitive parenting to the mix which likely enhances their partners ways. Cancers usually enjoy nurturing their loved ones, and one way this often manifests is via homemaking and cooking. Many Cancers take pleasure in providing for and caring for each other, whether materially, financially, emotionally or via daily acts such as cooking. Be careful not to take this for granted however! An appreciated Cancer is a happy Cancer. 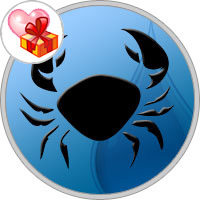 Easy to talk to, Cancers are very empathetic and their sensitivity makes them very alluring and easy to love. You will want to protect your Cancer from the big bad world and they will appreciate the gesture of protectiveness. Likewise they are also very protective of their loved ones and can easily be misunderstood in motive. They simply want their loved one to be okay and are willing to shift their own life around dramatically to ensure the well-being of the relationship. They both have definite opinions and if by chance their overall values are different, particularly on a political or spiritual issue, there is likely to be continual tension in the relationship. Cancer is sensitive and needs their companion to provide comfort, compassion and understanding. Aries have been known to lack the compassion, and can act before they think leaving a trail of emotional hurt in their path. If they realized this fact they could retreat and do damage control, but Aries quickly forgets as they are already on to the next challenge that takes their attention. Often they are unaware of the damage their rash actions have caused. This can lead Cancer to stew and brood, reliving the exchange in their mind intensifying the hurt each time. If this connection works it can be dynamic, but if it does not work it will be over before it begins. Cancer will pull the shutters down and walk away leaving Aries wondering what happened. Of course, it is inevitable in all relationships simply because we are all individuals that bliss will at some point be interrupted, this is unavoidable in life. And when they do hit a bump in the road to love, you can bet there will be the silent treatment between these two, and will break the ice? As Cancer is closely attuned to the energy of the ever-changing Moon, Cancer’s astrological ruler, they are prone to moodiness. Taurus is generally more even tempered, unless of course, they have a reason they feel justifies them not to be. The nurturing Cancer can turn into iceman or maiden in an instant and pull the shutters down, and if Taurus feels justified, they can dig their hooves in and are able to sit it out for what seems like an eternity. If the invisible curtain of silence goes up and the chill sets in, there’s no telling how long they will go without speaking. In the end, as the emotional Moon energy changes, Cancer will find a way to not give in, but to melt the icicles. These two live in parallel worlds. Gemini touches lightly and moves on, and if Cancer gets attached to something they never let go. Gemini may feel stifled by the crab’s possessiveness while Cancer feels insecure and threatened by the Gemini reluctance to commit. Not to say that Gemini is incapable of commitment, but the twins’ need for freedom is as legendary as the crab’s need for security. Gemini needs to talk – a lot – which may hit the Cancer crab shell like a brick wall. Cancer can be maddeningly close-lipped and private, their acute sensitivity causing them to withdraw. Gemini must use their hearts to understand their moon ruled partner, even clever Gemini won’t solve that mystery using the mind alone. Cancer won’t always be able to sense what Gemini feels and distance can grow between them. When Cancer does choose to communicate in words, Gemini better focus their attention to receive them. Cancer needs Gemini to sit still for a while and really listen. Cancer is generally very responsible with money, preferring safety over risky ventures. Gemini needs to experience all that is new, to explore and learn as much as possible, and the thrill of a purchase can outweigh the value of saving money, as far as they’re concerned. These two can find it hard to connect on the same wavelength for very long; differences in their essential natures may prove too conflicting to overcome. Being ruled by the moon, Cancer is moody and changeable. Two crabs together can be way too much sensitivity for any relationship to cope with. A potential for some pretty heavy dysfunction exists if – instead of mutual support with self-awareness – they allow themselves to plunge into emotional turmoil when confronted with each other’s inevitable moods or crabby remarks. Guard against over-reacting to slights, or imagining offenses when none exists. An area of likely conflict is money. If this union is to work, boundaries with cash and who pays for what need to be established early on. The cocoon of safety and privacy these two create, while protecting their vulnerability, can become limiting if enough outside stimulation is not brought into the relationship. To grow together, they must guard against becoming too insulated. Being a cardinal sign, Cancer is a natural leader, and can be bossy, even if they may not express it outright (though they often will.) Let your natural sensitivity help steer clear of any power struggles that may arise when both of you wants to captain the ship at the same time. Sagittarius can be brutally honest. In truth, they may just not think through what they say – it just comes out. Hurtful remarks, even if unintended, can be a deal breaker for Cancer, who feels things so intensely. This can cause many upsets, tears and trauma in the relationship. Once the centaur realizes what effect their actions have had on the crab, they try to smooth it over but without luck. When Cancer feels their trust has been betrayed, they hold on and don’t open up again easily, if at all. A fire sign, Sagittarius burns strong and fast, and can feel extinguished by the heavy waters of subjective, emotional involvement that is home to Cancer. Likewise, Cancer can feel the life sucked out of them by Sag’s constant buzz of activity. They require calm, soothing and more subtle environments. Sag needs their freedom; their spirits are restless and they must answer the call. And they love to flirt – it’s part of the adventure and thirst for life. Cancer needs security of all kinds, emotional above all, and can be pretty possessive and jealous. The centaur’s reluctance to commit and their need for space spells obvious trouble. Similar dynamics play out with finances. Sagittarius may strike Cancer as careless and immature with money, while Sag may resist the Cancer frugality as stingy and unnecessary. The Crab and the Fishes’ worlds are so closely aligned that they can get lost together. It’s such a comfortable and safe existence that taking action can be challenging. Somebody has to manage the practical necessities of life, and whichever among them this responsibility falls to can resent what feels like an unfair burden. Cancer is ruled by the moon and easily succumbs to moods and brooding which can swamp Pisces and drag them both down into the depths. The Fish may get frustrated by the intense subjectivity of their Cancer partners, wondering why the Crab doesn’t see the bigger picture. Red flag alert: the Cancer crab shell sometimes causes them to withdraw, which can wound Pisces more than Cancer realizes. Cancer must learn to trust; the boundaries they use to protect themselves may prove more than even compassionate Pisces can bear. The Fish have their own insecurities, remember. Foreseeable difficulties: Pisces procrastination can cause Cancer to get impatient. Cancer can be also be somewhat demanding, which rubs the fish’s scales up the wrong way.